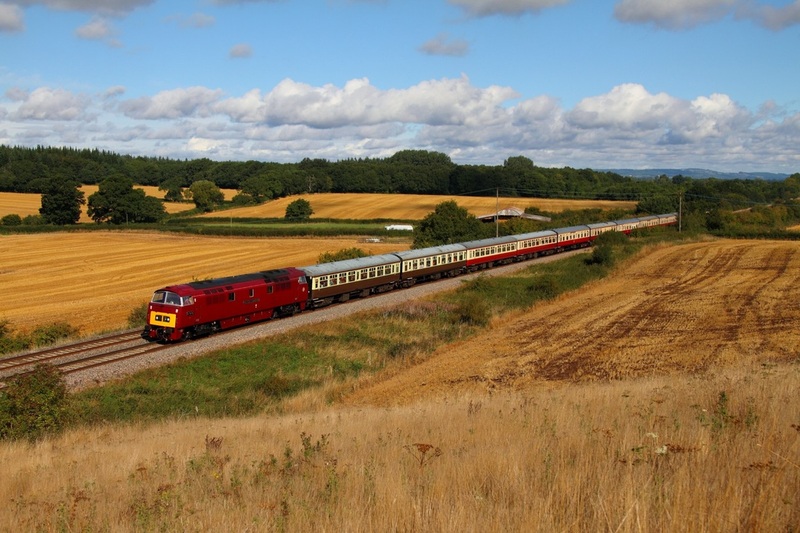 DRS 37688 leads 37419 on the 1Q14 Landore to Newport A.D.j at Llanellen south of Abergavenny on the 24th September 2013. 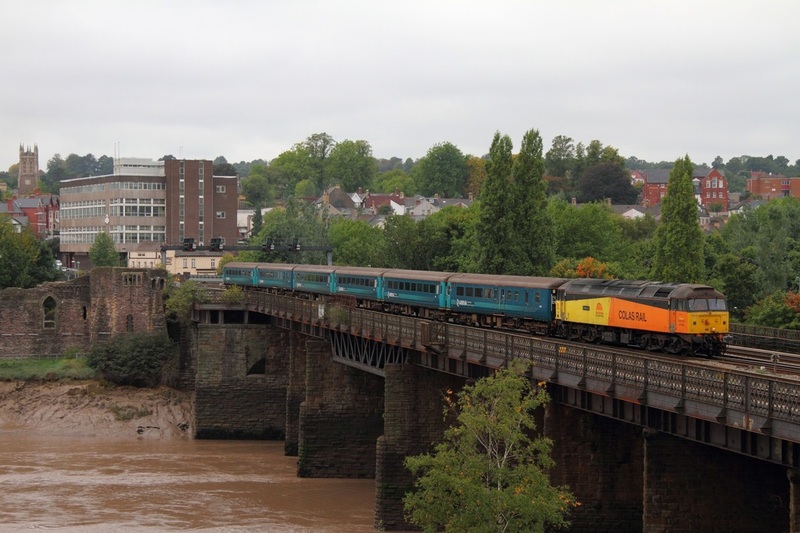 Colas Rail 47749 powers away from Newport hauling the 5Z56 Cardiff Canton Pullmans to Crewe CS consisting of six Arriva Trains Wales MK2s, previously used on the WAG Express services on the 23rd September 2013. 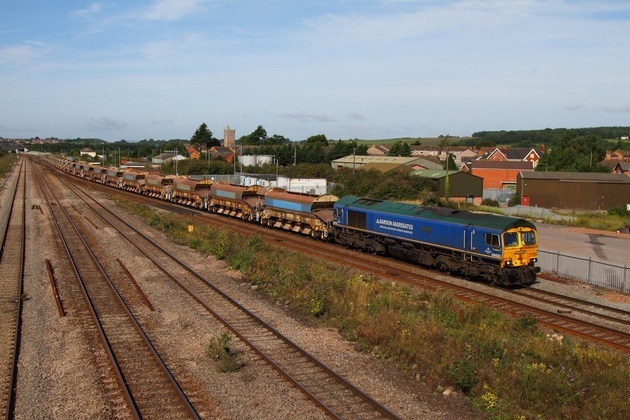 Left: DCR 56312 hauls the 6Z56 Long Marston to Totton yard at Croome Perry near Besford consisting of JRA 7067900957, JRA 7067900619, JRA 7067900593, JRA 7067900627 and PNA VTG 3794 on the 20th September 2013. 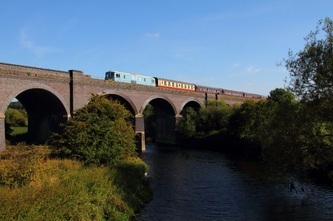 Below: After being held before Cheltenham to allow an ATW Cheltenham to Maesteg service depart and again at Haresfield loop to let 43301/357 on 1V54 overtake, the consist is captured passing Charfield running an hour early. The Grid will go light to Westbury tonight. 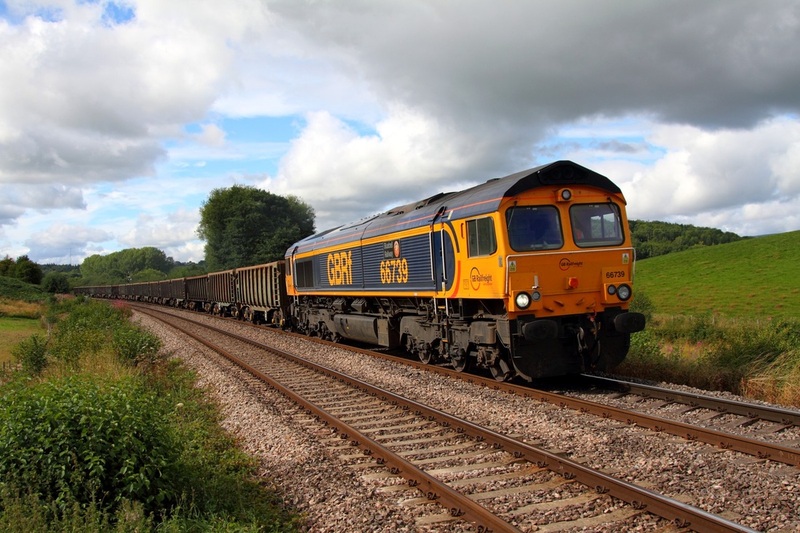 GBRF 66739 hauls the 6B85 09:20 Cardiff Tidal to Moreton on Lugg at Pontrilas on the 8th September 2013. 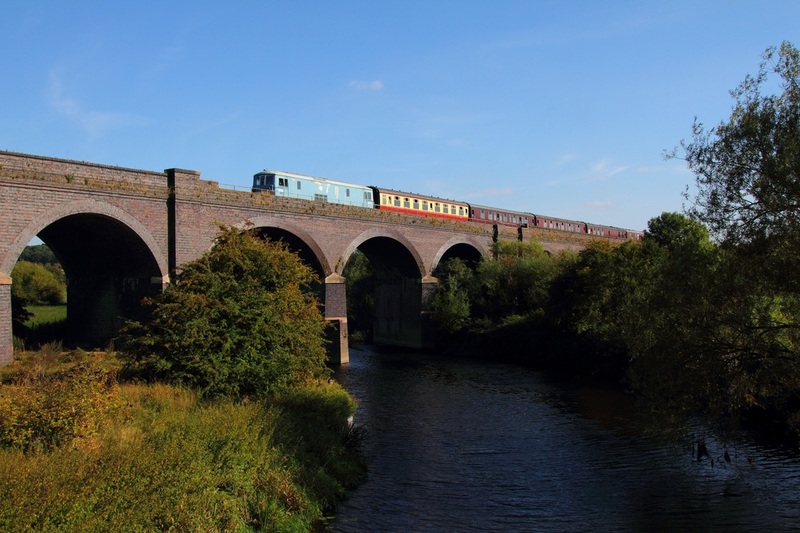 British Railways blue liveried 60163 'Tornado' hauls the 1Z82 London Waterloo to Cardiff Central Cathedrals Express at Magor on the 7th September 2013. 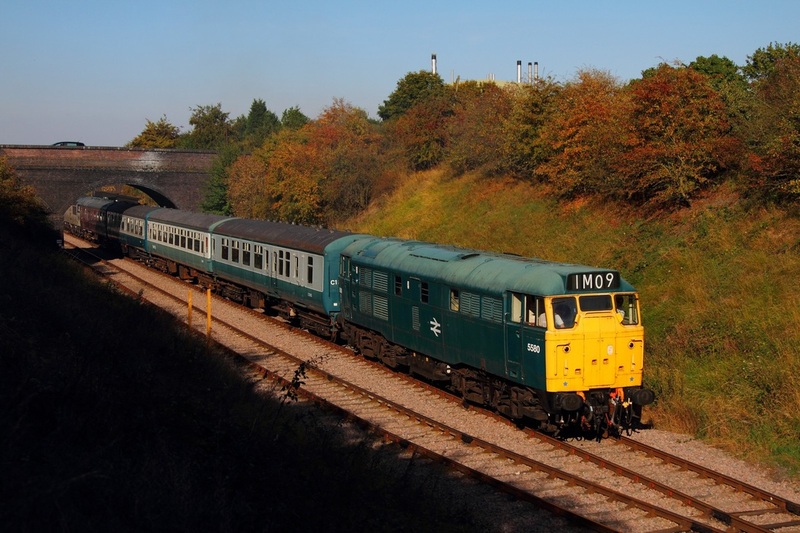 D1015 'Western Champion' hauls the 1Z52 05:53 Leicester to Weymouth 'Wessexman Western' Pathfinder railtour at Damery on the 7th September 2013. 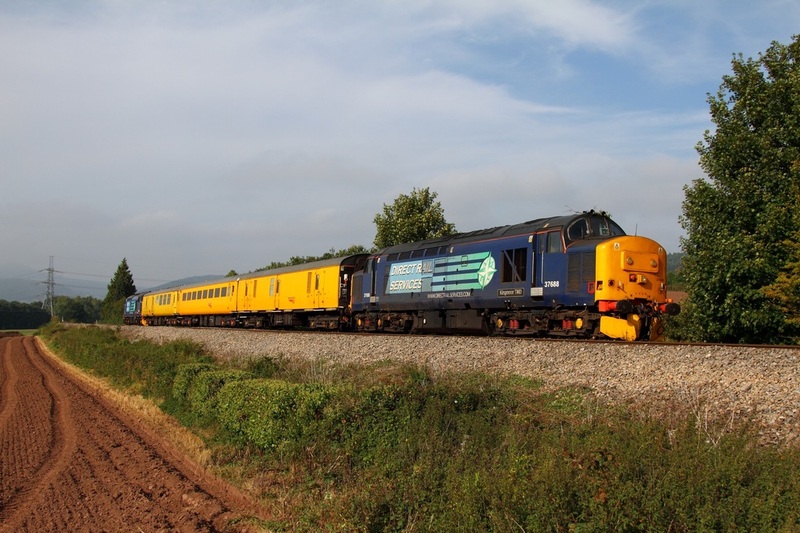 On the 6th September 2013, 59002 and 59004 the last locos in Foster Yeoman livery worked the 0Z40 Merehead to Eastleigh for a repaint into Bardon Aggregate industries livery as carried by 59001 and 59005. 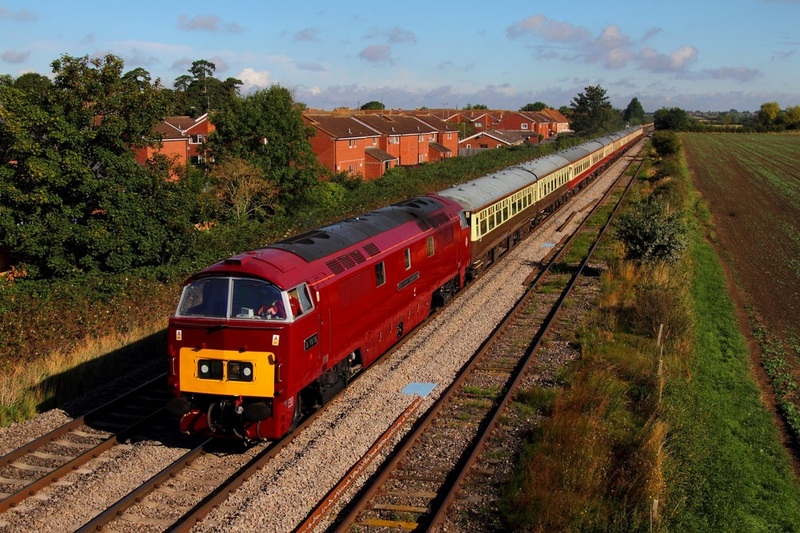 59002 'Alan J Day' was the last class '59' to receive the revised Foster Yeoman livery after it spent many years in Mendip Rail livery. 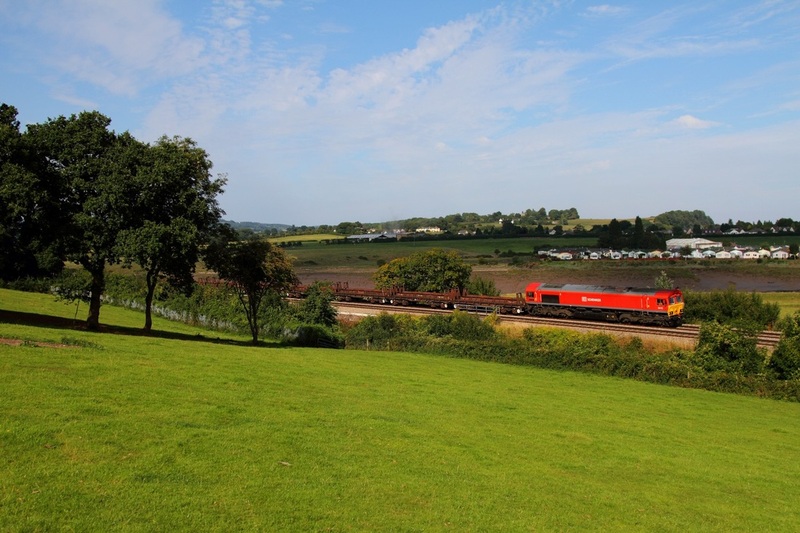 The GM locomotive works a Bishops Lydeard to Minehead freight service at Nethercott on the 10th June 2011 during a West Somerset Diesel Gala. 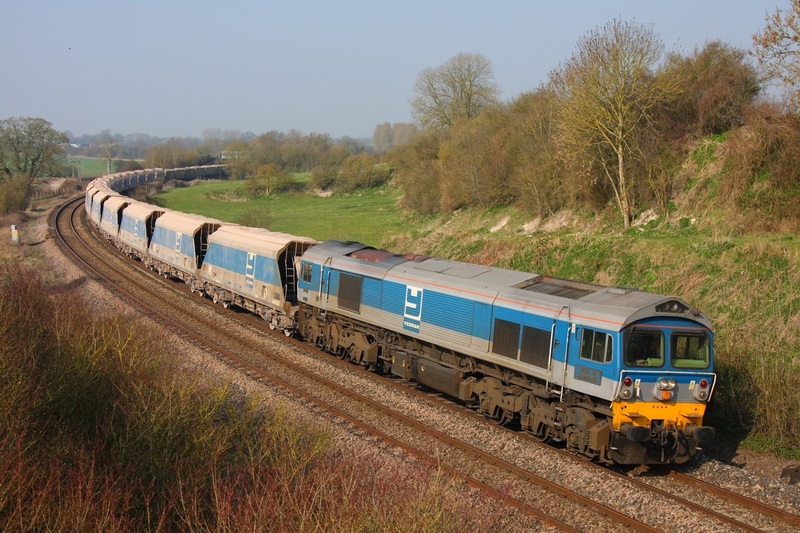 On the 25th March 2011, Yeoman liveried 59004 'Paul A. Hammond' works the 7A09 Merehead to Acton yard jumbo train at Crofton near Bedwyn. 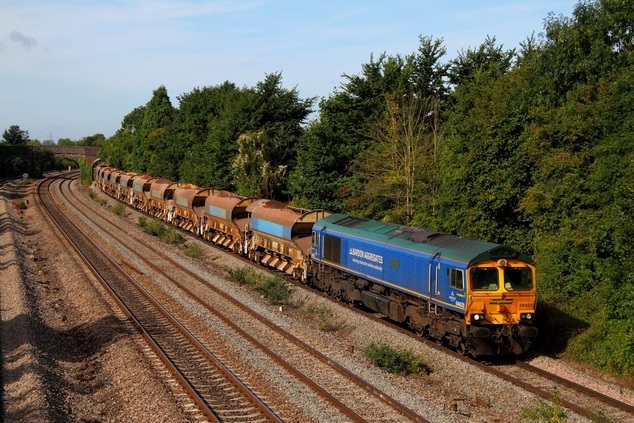 59001 and 59005 both carry Bardon Aggregate industries livery whilst 59003 is in Germany. 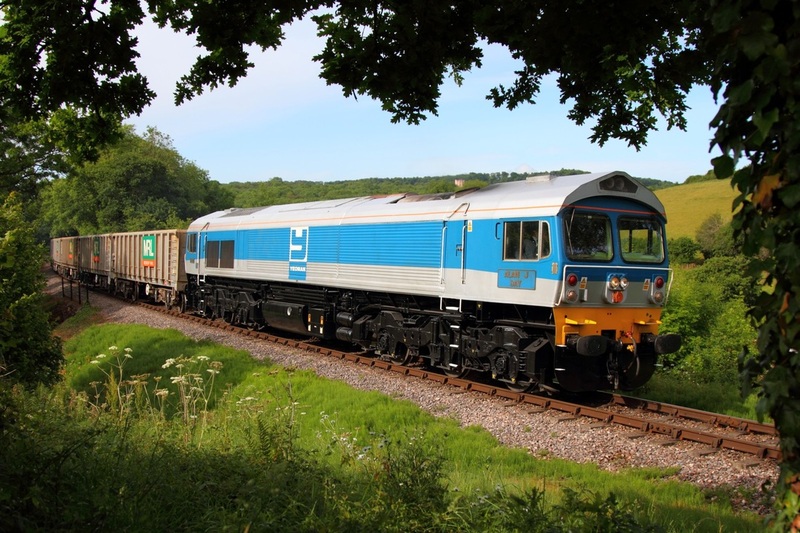 My Dad captured 59004 working the 6A83 Machen to West Drayton on May 1st 2013. 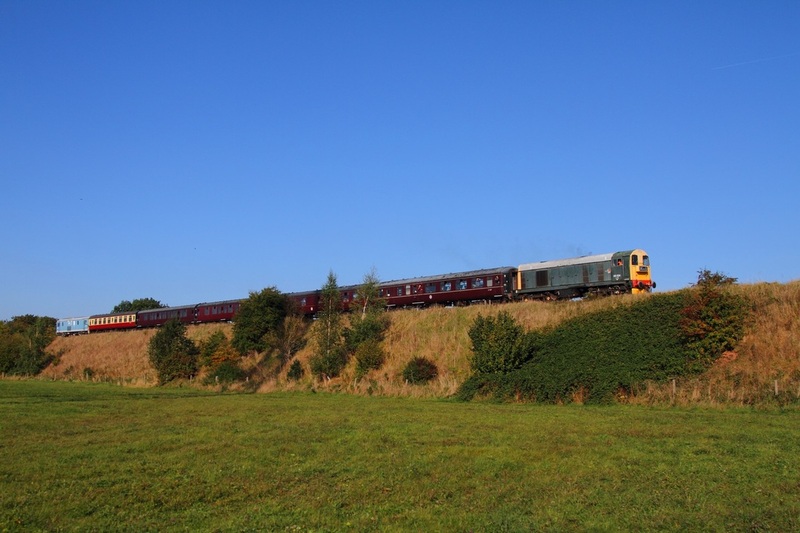 Click here to view the photo. 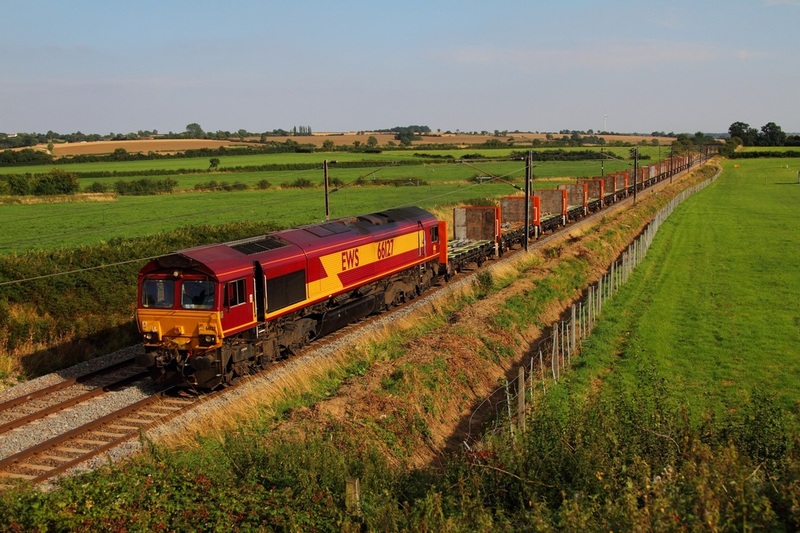 On the 4th September, DB Schenker liveried 66152 cruises through Thornwell powering the 6V92 Corby to Margam empty steel coils, 66136 was on the rear. 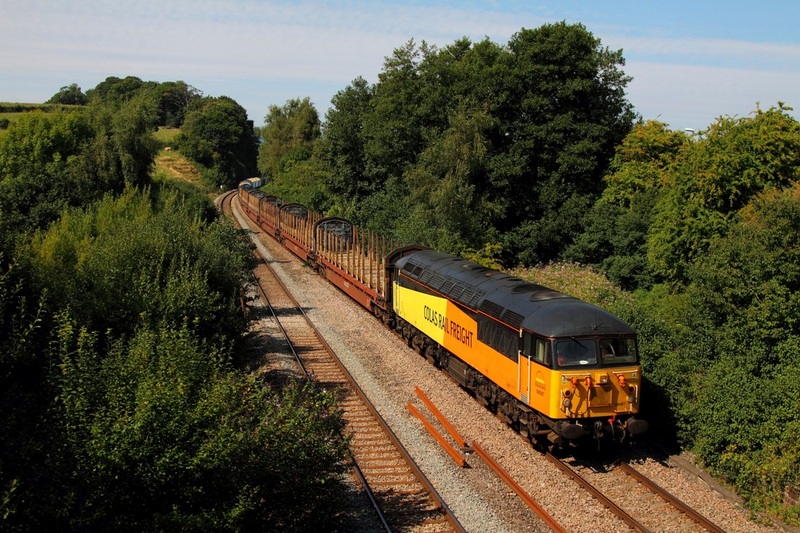 Colas Rail liveried 56087 hauls the 6V54 Chirk to Baglan Bay empty logs at Ponthir on the 4th September 2013. 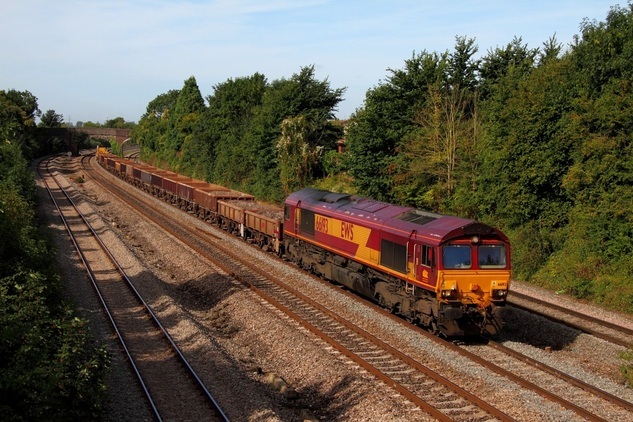 On the 4th September 2013, DB Schenker's EWS liveried 66127 on the 4E25 14:36 Biggleswade to Heck at Marston. 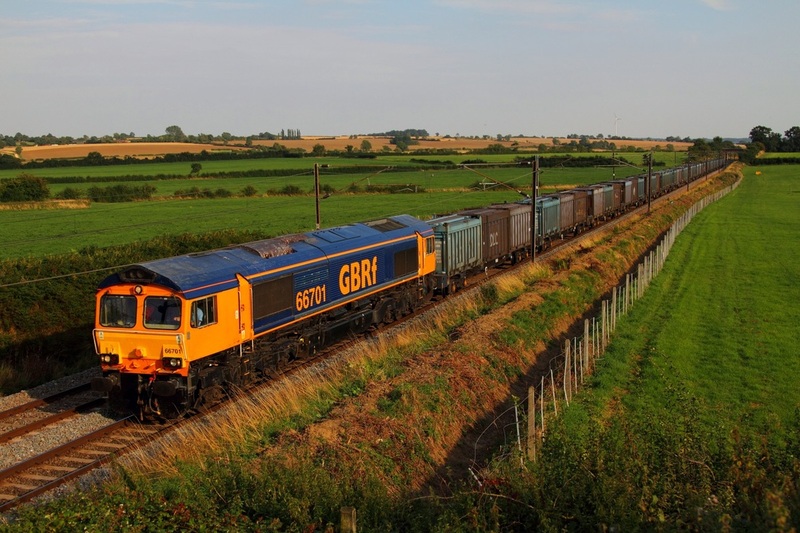 The maiden GB Railfreight 'shed', 66701 leads the 4E19 11:30 Mountfield to West Burton gypsum train at Marston just south of Claypole on the ECML on the 4th September 2013. 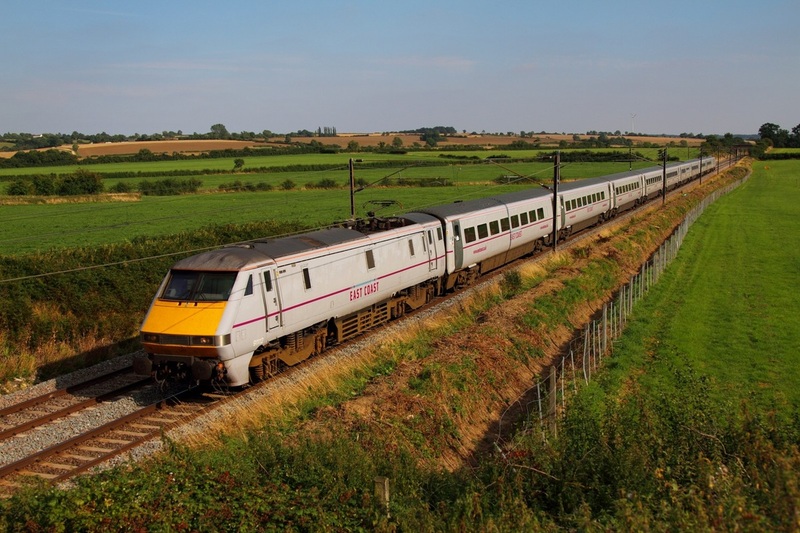 East Coast 91112 leads the 1D19 1505 London Kings Cross to Leeds at Marston on the 4th September 2013. 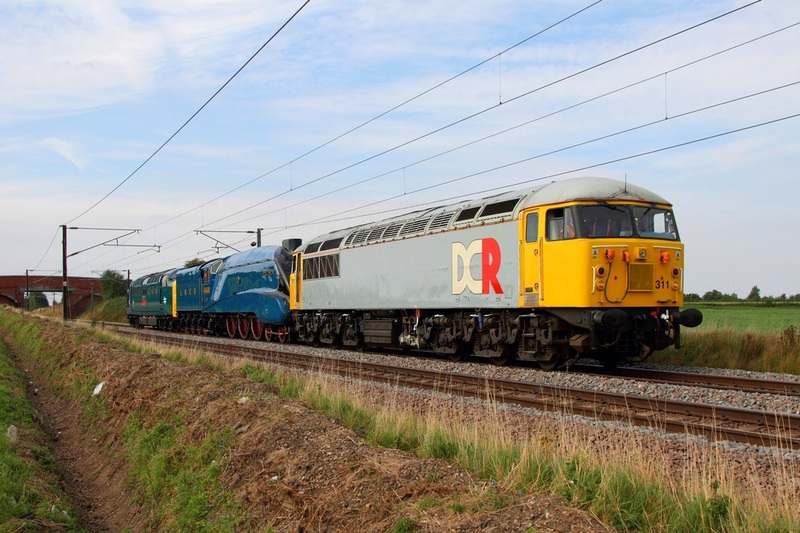 DCR 56311 leads LNER Blue 4498 Mallard, 55019 on the 5Z75 York NRM to Grantham at Marston on the 4th September 2013. 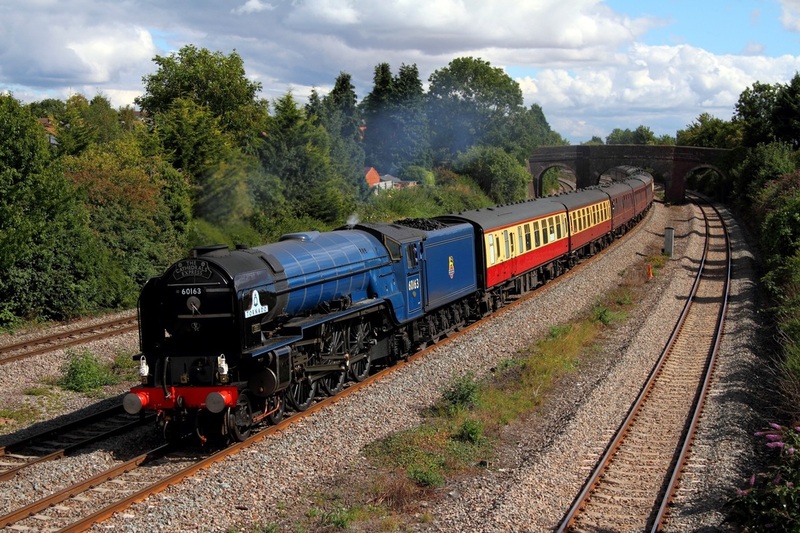 4468 'Mallard' is the world's fastest steam locomotive, having recorded a world record of 126 mph at Stoke Bank just south of Grantham on the 3rd July 1938. The locomotive is an exhibit at the National Railway Museum, York. Click here to visit a BBC link with details regarding the event. 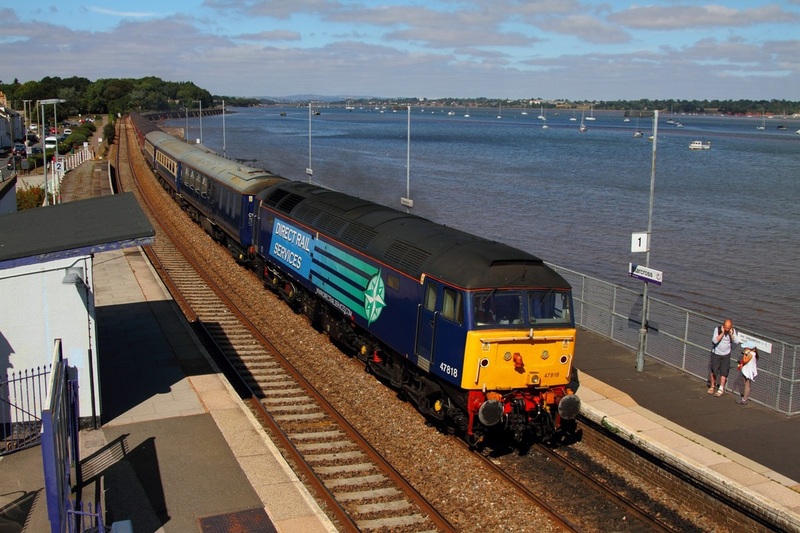 DRS 47818 leads 47501 on the 1Z72 Liverpool South Parkway to Paignton Compass tours at Starcross on the 2nd September 2013. 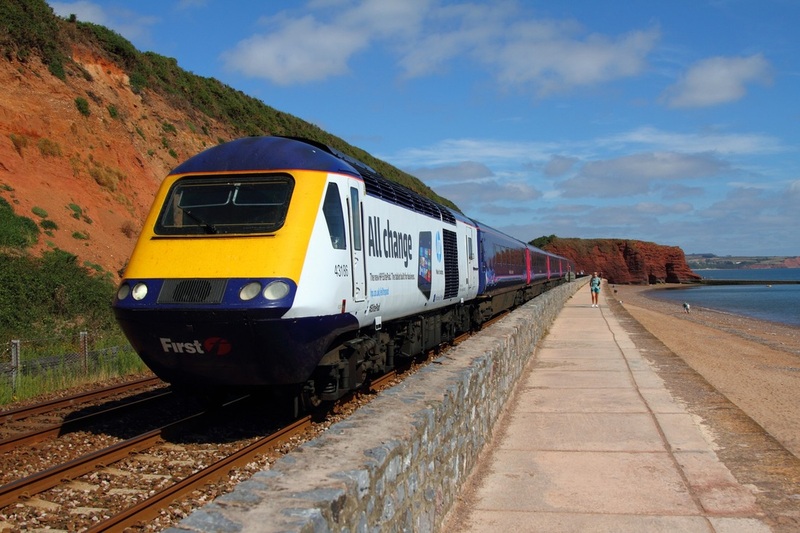 HP 'All Change' advertising liveried 43186 leads 43017 on the 1C09 London Paddington to Paignton at Dawlish on the 2nd September 2013. 43148 is also in the same livery. 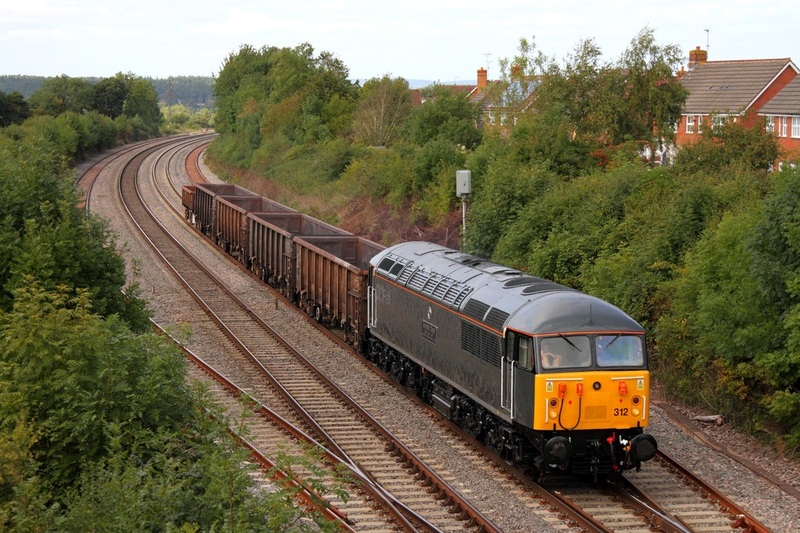 Bardon Aggregates liveried 66623 works 6Y40 Swansea loop west to Hinksey yard at Severn Tunnel junction on the 1st September 2013. 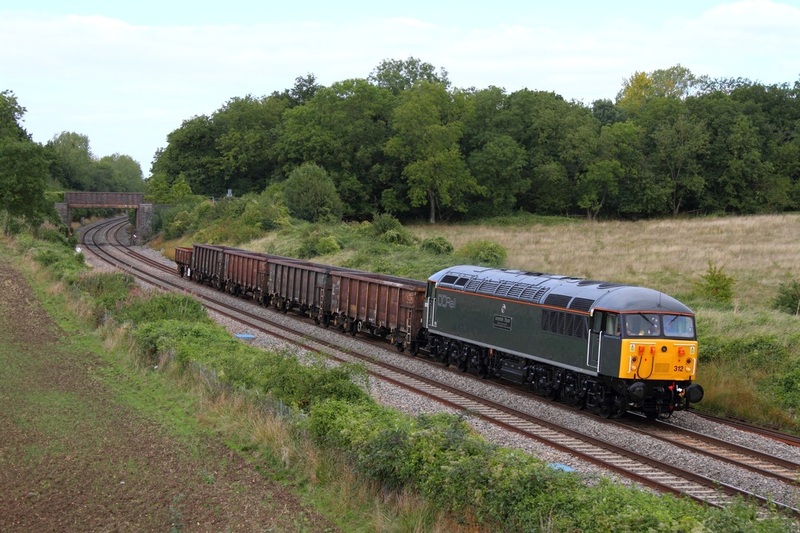 Following weekend engineering works at Llandeilo junction, Freightliner's Bardon Aggregates liveried 66623 works 6Y40 Swansea loop west to Hinksey yard at Undy on the 1st September 2013. 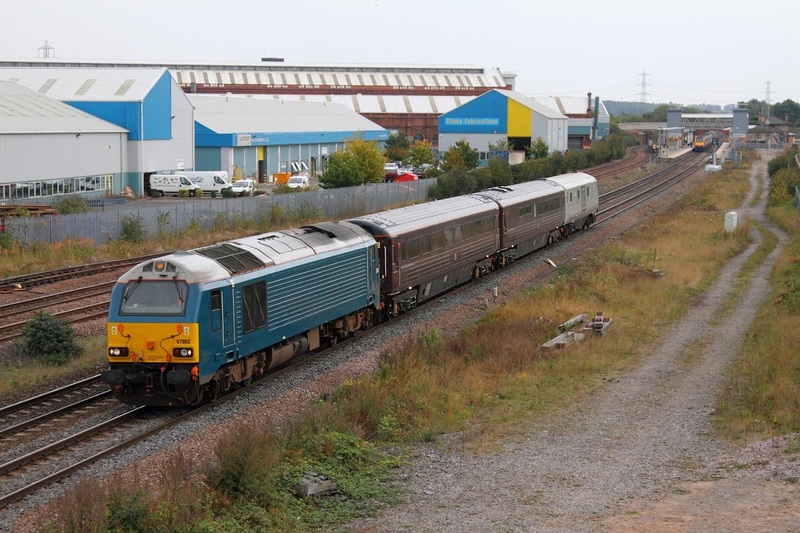 DB Schenker's EWS 66193 works the 6W48 Cardiff Queen Street to Westbury engineers at Undy on the 1st September 2013.